Is your little girl receiving her first communion? Please accept our sincere congratulations. It is a huge milestone in life. The first holy communion is a joyful occasion for all Christians. It is a beautiful way to unite with Christ, the sacrament of love and the journey of faith. If you are still looking for first communion dresses, this short article will help you to find out more about rules to follow, current trends and unique styles of special occasion dresses for girls. It is a big task for parents to select the suitable 1st communion dress their girl is going to love and member. First of all, think about length and color of the dress. To symbolize purity and innocence, girls traditionally wear long first holy communion dresses in white or ivory colors. Sometimes girls will also put veils or flower crowns. The best will be to consult with your parish beforehand because one cannot differ during this religious ceremony. Still, you want your little girl to look stylish and trendy without crossing any boundaries. Some communion gowns present mini replicas of bridal gowns. Just like bridal gowns special occasion dresses for girls feature hot trends and offer truly unique styles. For example, vintage lace is lately the designers’ favorite fabric for 1st communion dresses. Or famous dazzling embellishments that will make your little girl shine like a star. 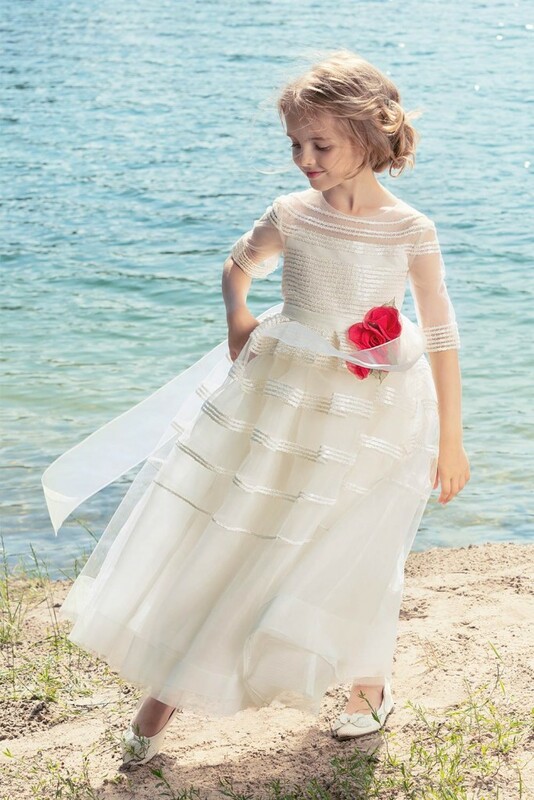 Just remember that from flattering silhouettes to personal touches, the first communion dress you choose must represent your little’s personality with class and elegance. A princess ball gown made of lace and tulle will let your girl walk down the aisle feeling like Royalty. One of the significant fashion trends back in style is a ball gown with Princess Diana’s puffy sleeves. This retro style of communion dresses with handmade flower décor on puffy sleeves will make your little girl look not only like a princess, but also sweet and innocent. 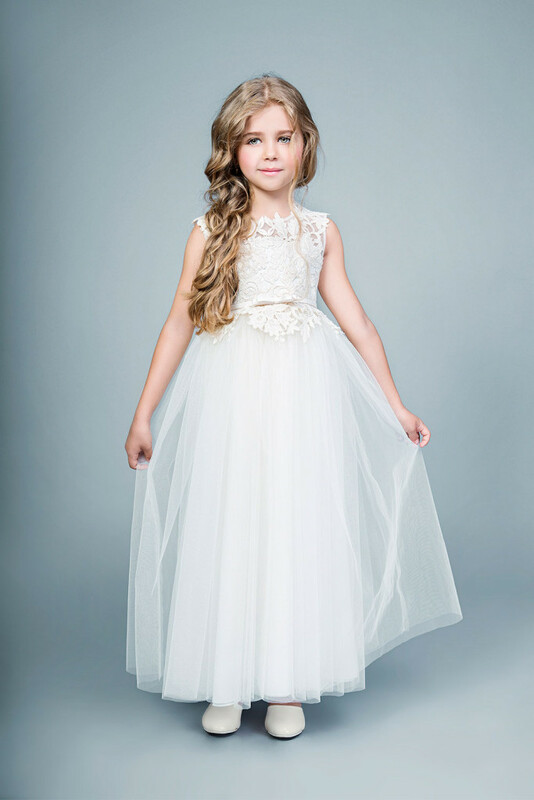 Another top style of first holy communion dresses is bohemian. It has been winning for the last couple of seasons. Go back in time with a modern design of a communion dress made of vintage lace. Or create an effortless boho look by buying a communion dress with the lace tiered down. This year designers also presented boho dresses for girls with different types of sleeves and open backs to make them look even cuter walking down the aisle. Long sleeves, cap sleeves, or 3/4 sleeves are all on trend. Decor plays a significant role in defining the charm of a dress. What do you think about a sleek modern communion dress with a sprinkle of sparkles? This beautiful style is decorated with sequins to let your little angel shine during this joyous occasion. Not found of gleaming, there are plenty of other choices. For example, communion gowns embellished with pearls, beads, or Swarovski crystals. You can also choose handmade flowers or butterflies. They will finish the dress design and add a whimsical feel to it. Keep it simple with a classic A-line dress. It will be perfect for girls who wish to look elegant on their communion day. Other designs in this style can be the 1st communion dress made of lace and tulle with simple embroidery. It will make your child look sleek, glamorous and gorgeous in her holy wear. 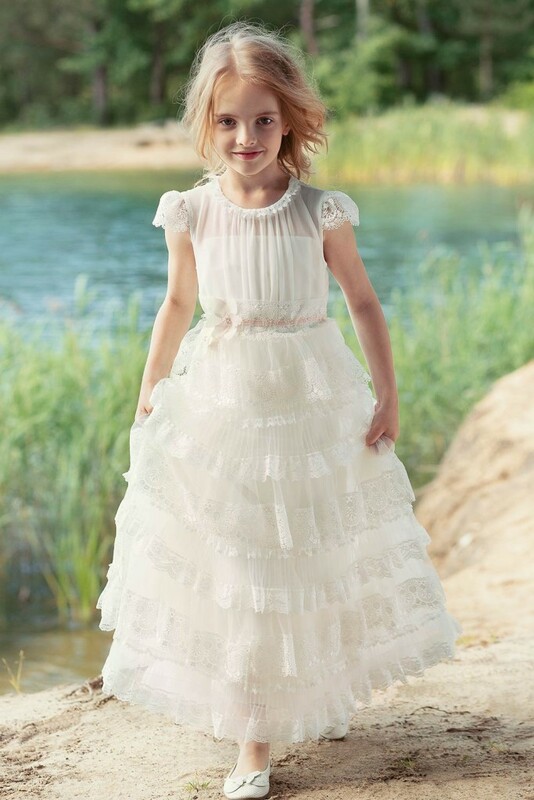 For a little more flare, let your little girl be comfortable in soft and light organza ruffles with a touch of lace. No matter the style you like, you want your little girl to wear something she is going to be fond of. That’s why make sure to ask her some questions before and include in the process of choosing the One. Besides, it is a great time to bond and find out more about your daughter’s fashion taste. 1. What dress are you dreaming? 2. Who is your favourite cartoon personality? Who has the prettiest dress? 3. Do you like sparkles? … flowers? … butterflies? Now that you have some ideas, it is time to start shopping for the most beautiful, stylish and trendy communion dress for your little girl. You want her to look pretty and feel special on this religious occasion. Choosing the right dress will help you to cherish and remember this moment forever. Papilio Kids online boutique feature not only modern designs of first communion dresses but also superior in quality. Get inspired by checking our collections here.